A long time ago (circa 1969), before the creation of a BC Provincial Emergency Program and the North Shore Rescue team, when a climber (almost exclusively climbers in those days) was in trouble, folks like George Zilahi and Bruce Brink would join a very loosely knit group of civic minded climbers to go out and do what they could. In the day, the Alpine Club of Canada, UBC Varsity Outdoor Club and the BC Mountaineering Club maintained a list of telephone numbers and that list was the Mountain Rescue Group. There wasn’t much training and not much specialized rescue gear. We had “portable radios” that used tubes and might reach a mile or two in the mountains and we used (rarely) piston engine Bell Ranger helicopters as turbine aircraft were not yet in common use. Although “modern” European mountain rescue know-how was slowly trickling to Canada thanks to Mountain Guides Willie Phister and Peter Fuhrman, both fathers of the Parks Canada Public Safety Program, the boys wanted a closer look at the European mother lode of experience. For Bruce and George, attending the 2002 RIGA AirMed conference in Switzerland was the bait that attracted them to the ICAR meetings at Cortina Italy in 2005. This was a real opportunity to compare European and North American mountain aviation/medical strategies and over a few years ICAR expanded, attracting participation, and knowledge base, from every continent. We learned a lot of things that would be useful at home where demographics and geography would dictate a uniquely Canadian approach. Bruce and George have been part of the Medical, Aviation and Avalanche Commissions ever since. Back then, Canada was officially represented at ICAR by Parks Canada and by Dr. Mike Swangard and Dr. Jeff Boyd, both early members of the ICAR Medical Commission. We also had a presence in the Avalanche Commission thanks to Mike Wiegele and Bob Sayer and also in the Aviation Commission thanks to Clair Israelson and Mark Ledwidge of Parks Canada. In later years the enthusiastic and untiring support of Swangard and Wiegele, both senior members of IKAR, would prove to be an essential component of the successful application for ICAR approval of the first Canadian Diploma in Mountain Medicine Course. Dr. Dave Watson came along to the 2006 ICAR meetings in Slovenia as part of the Canadian Ski Guides Association and then we really started talking. Dave’s networking skills are legendary. The how-to part of the DiMM picture seemed to gel in 2009 at the ICAR meetings at Zermatt with the idea that a Canadian Diploma course might be possible and our first working group meeting was in the summer of 2010. By now Dr. Ross Brown was in the picture and he led the charge to have the Canadian Diploma Course recognized by the University of British Columbia Faculty of Medicine Continued Professional Development as valid maintenance of competence training for graduate physicians. This provided an academic association for the DiMM which was essential for final ICAR approval of the course. 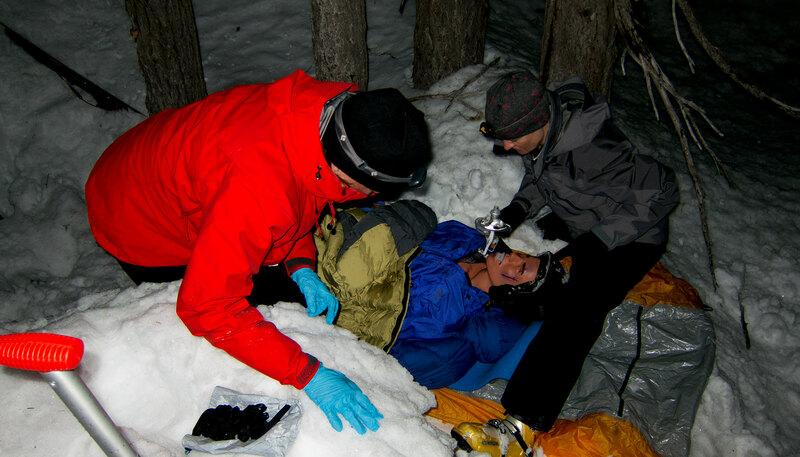 The Canadian Society of Mountain medicine would be the framework to deliver regular ICAR/UIAA Diploma Courses, future advanced rescue modules and it would include a research arm. We also felt that the CSMM should collaborate with operational Mountain SAR assets such as Ski Patrols, PEP Teams, Heli and Cat Skiing, and the aviation community in a research, advisory and advocacy role. In 2011 the CSMM received formal status as a non-profit organization and in the same year the ICAR Medical Commission approved our application for a Canadian Common Course (DiMM). The CSMM roots go back to the Old Country. We pay close attention to the international history and experience but we must move in a direction that reflects Canadian needs. Thanks to UIAA/ICAR and to the hard work of many, CSMM is in a position to fully integrate terrestrial and aviation rescue with mountain medicine training.